All on 4 dental implants is a permanent solution for replacing a full mouth or a full upper or lower set of natural teeth. All on 4 implants uses four to six titanium or zirconia dental implants per jaw to permanently support a full mouth of implanted teeth. We are an All on 4 implant clinic in Burtonsville near Silver Spring and Columbia Maryland. The biggest differences between Maryland Holistic Implant Center vs Clear Choice Implants: 1) We are not a national chain 2) Dr. Adams will complete your entire case including the implants, the teeth on top and any necessary sedation. 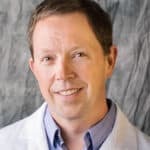 Dr. Adams will take the time necessary to be sure you understand all the different implant teeth options and take a complete interest in your care, comfort and satisfaction with case outcome. There are many different teeth options used for All on 4 teeth. Some are made of plastic and feel thick like dentures (hybrid dentures) and others are smooth, thin, and made of porcelain and zirconia. Read this about how not all “All on 4 implant” cases are created equal. Very important to understand what you are getting. If you don’t know, you are getting plastic because the zirconia teeth (Bruxzir and Prettau) are a lot more expensive. If the dentist is using an in house lab, you are getting plastic/acrylic. New all zirconia-porcelain teeth are made by multimillion dollar teeth milling units and are unaffordable by dentist offices. I often get questions about whether all the teeth can be replaced in a day? The answer is yes, we remove all the bad old teeth and the patient gets a set of new teeth that same day. Often, marketing on the internet and TV commercials by Clear Choice implants can be confusing if not misleading. Call for a no cost consultation with Dr. Adams. Dr. Adams will review the details of your case and compare our plan to Clear Choice cost and plan. Read the blog post about Why All on 4 should not be finished in one day. Less healing time than other full mouth permanent implant options such as a full mouth of individual implants and bridges. requires less bone to be present for permanent implant teeth. All on four is the best option for people looking to upgrade from a removable denture to permanent implants. Faster healing and recovery time than other full implant options due to less surgery. Provides permanent tooth replacement that functions similarly to natural teeth. No more denture glue, aka fixadent denture adhesive. Eating corn, apples and ribs are no longer a problem. All on 4 permanent implant bridges never get cavities, decay, need root canals. While implants have many benefits, All on 4 dental implant problems do exist and the reviews are not all good. The outcome for the patient really depends on setting an appropriate expectation for the patient (based on the individual case) and the skill of the implant dentist and the dentist and lab doing the All on 4 case. Clear Choice dental implants has made all on four very popular. The biggest advantage of our practice vs Clear Choice is Dr. Adams will complete your entire case. With one implant expert performing the case there is no opportunity for any miscommunication or transitional mistakes. Note: Progression of Bone loss when teeth are removed and not replaced. Bone loss is prevented when implants are placed as in cases of All on 4 dental implants. Platelet Rich Fibrin and PRF in implants have made dental implants heal better and faster. How does All on four Implants Work? The process of receiving All on four involves evaluation, treatment and healing. Dr Adams will start by providing a no cost consultation to learn about your expectations and needs. We will then perform a complete evaluation including a 3D xray or CBCT scan of the structure of your jaws. The next step involves placing four to six dental implants for the best possible results. Proper placement of these implants is crucial. Unlike other options, All on 4 can work in areas where bone loss has occurred, making it a more ideal option for those who have suffered from ill-fitting dentures. 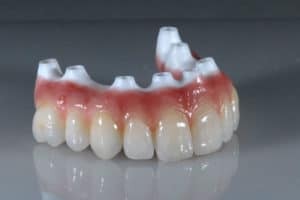 All on four is ideal for patients who cannot tolerate removable dentures and need permanent implant dentures or implant bridges that stay in the mouth. Once the implants are placed at Maryland Holistic Dentist, a custom-crafted, beautiful full set of implant brides are secured using the four to six implants as support. All on 4 are permanent implants do not require removal. This means you can eat and sleep with your new teeth, just as you would with natural teeth. There will be no need for denture soaking or glue. All on 4 implants cost? How much is All on 4? How much is All on 4 cost? Basically, the all on four dentist needs to remove all the remaining teeth, perform gum clean-up/smoothing called “alveloplasty”, do some bone grafting, place several dental implants, make same day teeth. The teeth can be made of Acrylic or Zirconia. The Zirconia teeth are thinner, look and feel more natural and are far more durable. The Zirconia teeth also do not have any metal. The Zirconia teeth called Bruxzir or Prettau are more expensive then hybrid dentures. All in 4 Price? All on 4 Price? Start to finish, zirconia teeth cost $55-65K for the entire mouth. All on four for an entire upper or just lower costs $30-35K. We will Place up to 6 implants per arch for a total of 12 implants. Clear Choice all on four usually only includes 4 implants and charges extra for bone grafting and additional implants. Clear Choice all on four normally uses plastic for their teeth aka hybridge or hybrid dentures. We do not use any generic or knock-off implants. In almost all cases we use zirconia which are thin, beautiful and contain no metal or plastic. All on four cost for plastic / acrylic? Start to finish acrylic all on 4 teeth cost $50-60K for the entire mouth. All on four for an entire upper or just lower costs $25-30K. Acrylic or plastic All on four is also called hybrid teeth. “hybrid” term is used because it is basically a denture hybrid in that the material is the same as a conventional denture (plastic teeth and gums) but instead of stick or suctioning to gums, the hybid teeth are permanently fixed to the implants with a screw-retention system. all on four reviews are generally very good. Especially for the new zirconia All on 4. The bridge is very thin, smooth and far more durable than acrylic. Zirconia full mouth implant teeth are also called Bruxir full mouth and Prettau. 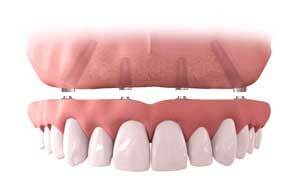 Hybridge is another name for plastic or acrylic full mouth all on 4 implant dentures. It is very important to understand the differences between the kind of teeth on top of your implants. Do your research. people with more gum and bone who have more recently lost teeth may be happier with individual implants supporting individual crowns and small 3 tooth bridges. Contact Maryland Holistic Dentist to schedule an All on 4 consultation. All on 4 is an ideal solution for those with extensive tooth loss or those who currently wear dentures. Our implant specialists are trained, certified, and experienced in All on 4 treatment. We will help you determine if All on 4 is the right choice for you.